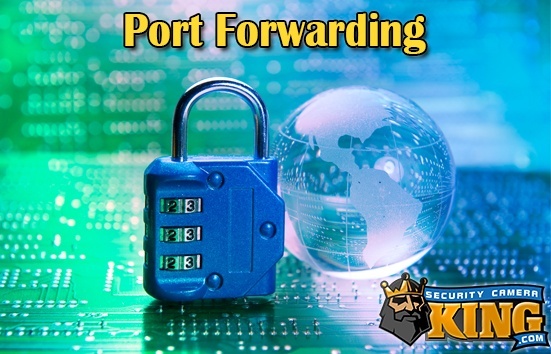 Now that you’re interested in security cameras, it’s the perfect time to learn about what port forwarding actually is. There are a few questions regarding it, such as what even is port forwarding, and how does it relate to your security cameras. Port Forwarding all begins with something called Network Address Translation- merely the address that is just given to your router specifically for your own private network! Just as when you move into your house without choosing your address, the network address is thus given- and more importantly, just as you use your address to alert others where to basically send things and communicate with people via package, letters, and mail, the address exists in order for your computers to reach out to one another and “talk” as well. With your internet however, there is an address that is only for your computer, or in other words is unable to be routed (would end up being like a package that is sent to yourself), and there is also an address that can easily be sent out into the internet for ready communication. All of this adds up to the fact that NTS will see the first address as well as the second address, understand or compute the difference between the two, and recognize them to be part of one device, part of a whole. Whenever two computers would like to “speak” to one another one of them will ask the other technologically. Just as you may sometimes ask for a friend request via Facebook, or even simpler ask someone for a phone number, in this initial step to port forwarding, your computer reaches out to another to connect to it. Port forwarding is actually what initiates the computer directory. When individuals call into a business, typically a receptionist is there to greet them if not gotten through to directly, and transfer their calls to exactly where they need to be going. Port forwarding functions much in this same way as well. The port portion of port forwarding happens to be a number, and it acts as an assistant to the computer for doing the connection it needs to reach out to other computers. All of this port forwarding is a ton of tech information, however it is certainly valuable information to understand when searching for your devices at Security Camera King. Port forwarding is excellent because it works towards a safer network for you, which is obviously incredibly imperative when you are looking for something to keep your property, business, and family safe and sound. You need to be sure no one is able to remotely tap into your video surveillance cameras, make sure it isn’t incredibly easy to get the footage you so carefully recorded. Port forwarding has created some extremely exciting advantages in the world of security cameras. At at Security Camera King we offer numerous IP cameras, sort of the jewel of our website. These are extremely impressive in the world of technological advancement, security wise, as port forwarding gives the IP cameras we sell, as well as all IP cameras in general, the ability to exist as a stand alone tech device. Port forwarding, when applied to the world of security cameras, is the technique that is required when reaching out to see your device from anywhere other than directly in front of it! Port forwarding allows you to view your cameras remotely, point blank. Each of your computer devices you typically find within your home come together in order to make up LAN, your local area network. There are some steps involving this. It is important, first, that you setup your static IP address so that all of the data and signals are able to properly go through and may properly be picked up. The next important “code” is the subnet mask and default gateway, and absolutely must be given to your security device in order for the port forwarding process to function. The third step involves the DNS server address, of which the IP probably has. All this basically does is give the address, or any web address, the ability to be reached through a title. The last portion is basically to find the port number. It is usually a good idea to keep the default number. So those are some of the very basics of port forwarding. In the end, port forwarding is necessary to view your devices from a cell phone or any other computer. Originally security camera system users were unable to view their cameras due to something blocking the entrance- this is what is known as the firewall. Port forwarding is the connectivity that allows you to get through with your other devices and view each of your cameras. Check out Security Camera King today to view all of our security cameras, NVR’s, and DVR’s- we’ll be able to hook you up with a device you’ll be able to view from basically everywhere. Call us at 866-573-8878 today!